General purpose tools usually require complex configuration which, more often than not, can be a huge pain. If you’ve ever tried setting up something like Webpack, you probably can relate to that sentiment. Introducing zero-configuration toolkits, a new wave of toolkits that promises to make life easier for deploying your projects, such as static websites. In this article, we’ll introduce you to x0, a zero-configuration toolkit for React development of static sites, and show how you can create a static website using zero-config toolkit stack of x0 paired with Contentful for content infrastructure and Netlify which hosts static websites. Check out an example of a static website that supports real-time data and download the files we’ll be working with in this article. What is zero config toolkit? The main way to reduce process repetition and complexity when deploying a static website is to have as few dependencies as possible, ideally just one, to start shipping the product to production. Zero-config toolkits are continuously updated. The toolkit automatically keeps its own dependencies up-to-date. The absence of an application-side config allows seamless updates without code changes on the app side. Low-maintenance and low cost. There is no need for a server since all the content is embedded directly in the HTML and, with Contentful, hosting is provided via Netlify. Made for SEO. Crawlers can parse content from the page’s source code. The only downside is, as mentioned, that you lose the ability to have real-time data. 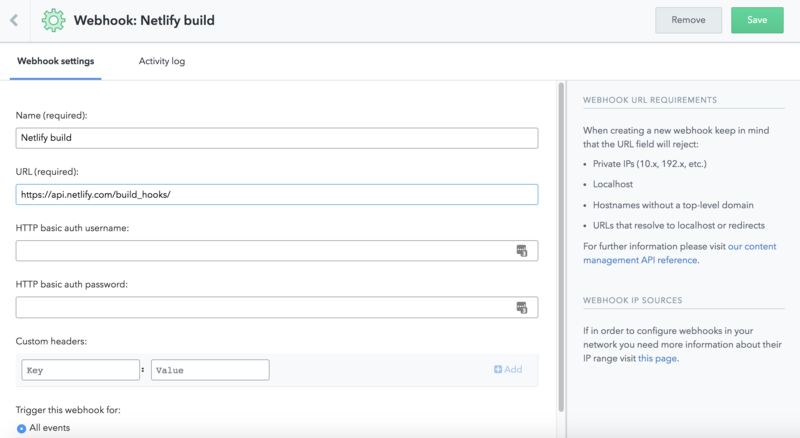 We do have a solution to address content updates; that is to trigger a CI build script using webhook from Contentful. While npm is doing its thing, use the time to sign up for a free Contentful account — you can make it even easier and sign in using your Github account with one click. x0 supports styled components, and isn’t limited to just the native styled-components API. In fact, it can also be used with any framework built on top of styled-components such as Rebass. x0 supports asynchronous data fetching using the getInitialProps hook. This was inspired by next.js and has just one limitation: for now, it's only supported at the top level and cannot be used in child components. This example uses Contentful as the data provider. A webhook is a way for an app to provide other applications with real-time information. This section is where the magic of adding real-time updates to your static website happens. Contentful allows creating an outgoing webhook to notify application consumer that the data was updated. This way, the static website will be rebuilt each time modifications happen from you changing content on Contentful's side. It's called a zero-config toolkit, but if you still want to configure things, x0 doesn't compromise on that and supports extensibility by using custom webpack configs. Let's learn how to add a TypeScript module like a custom webpack configuration with the TypeScript loader. We can now proceed to use a custom configuration with x0. x0 can help hasten the development and launch of landing pages by allowing developers to concentrate on code. We learned how using zero-config toolkits helps to reduce time-to-production by eliminating the costs of creating and maintaining various configurations. So go ahead and create that free Contentful account and get your zero-config static site online, or try out the many other wonderful ways Contentful's content infrastructure can help support you and your web projects.